Simona, of Anticovalore.Etsy.com made this book for our swap. Simona calls this a pocket-sized journal, a "perfect size to keep track of your life!" 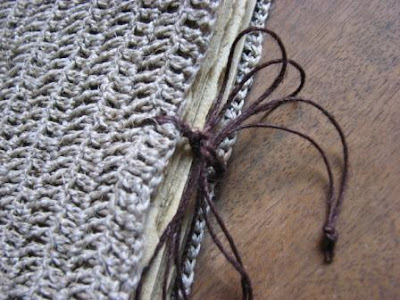 She crocheted the cover using hemp and also used old hemp laces to create the tie closure on the fore edge. 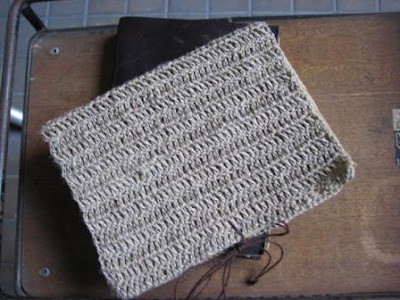 The text block is made with recycled paper. Visit Anticovalore.Etsy.com to see more of Simona's books. I was the lucky recipient of this one! It's great! I love her crocheted books. Such a unique idea! What a unique journal! I have not seen this before.